Black and Decker, is a renowned name in manufacturing and marketing quality power tools, accessories, home improvement products and hardware. Black and Decker bring to you their line of Black and Decker Circular Saws. They bear in mind the requirements of a Do-It-Yourself ', while also making products for professional users. Black and Decker offer you corded circular saws and cordless circular saws. Both have their own merits and downfalls. Power is what one experiences, primarily, when working with corded circular saws. Cutting through thick sheets or for doing heavy-duty work, Black and Decker saws do it all. From the range of Black and Decker saws, come essentially two types of corded circular saws. The Black and Decker Saws CS1012 with 12-Amp delivers power for cross cuts and rip cuts in all types of wood. Loaded with ergonomic front and rear handles for assistance, it provides good control over the saw, while working. This saw comes with a calibrated depth adjustment for accurate cuts and the bevel adjustment delivers precise 0-45 degree angled cuts. This Black and Decker circular saw provides smooth and fast cutting with it 18 tooth carbide blade. The Black and Decker saw CS1030L with 13 Amp power and a 7-1/4 Inch laser saw is a fantastic tool to make clean cuts guided by the laser. The laser is powered with a cord rather than batteries. This saw also consists of a front and rear handle with soft grips. With the CS1030L, it is quick and easy to change depth angles, serving hassle free work. Drawbacks experienced with this Black and Decker saw is that it lacks the rip guard and does not include the spin lock button which prevents the blade from spinning. Tired of getting trapped in between cords while working? From the range of Black and Decker circular saws comes a range of cordless circular saws, powered for trouble free work. Black and Decker Firestorm FS18CS cordless circular saw delivers great magnitude of power for such a portable tool. 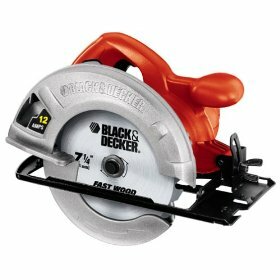 This Black and Decker saw can cut bevels up to 50 degrees and can rip through wood up to 2 inches thick at a 45 degree bevel. This saw comes with a spindle lock for hassle free blade changing. Reviews indicate that the modest battery of this saw can be interchanged with other Firestorm 18-volt tools, which serves to be cost effective feature with this product. A demerit to this Black and Decker saw are that the 6-1/2 inch 18-tooth blade could have more tooth count for smoother cuts. Furthermore, it is quite inconvenient to reach and push the safety button. One would also have come across The Black and Decker CS1000 12 Amp circular saw with a 7-1/4 inch saw it is quite light in weight yet powerful. With easy to hold front and rear assist handles, it lacks when it comes to making 90 degree cuts. It is safe to say that Black and Decker Saws come with a lot of merits for an affordable price, thus in my honest opinion it could make a great piece of tool to own. Return From Black and Decker Circular Saws Page to Home - Finishcarpentryhelp.com.